The substitution of natural gas by a renewable equivalent is an interesting option to reduce the use of fossil fuels and the accompanying greenhouse gas emissions, as well as from the point of view of security of supply. The renewable alternative for natural gas is green natural gas, i.e. 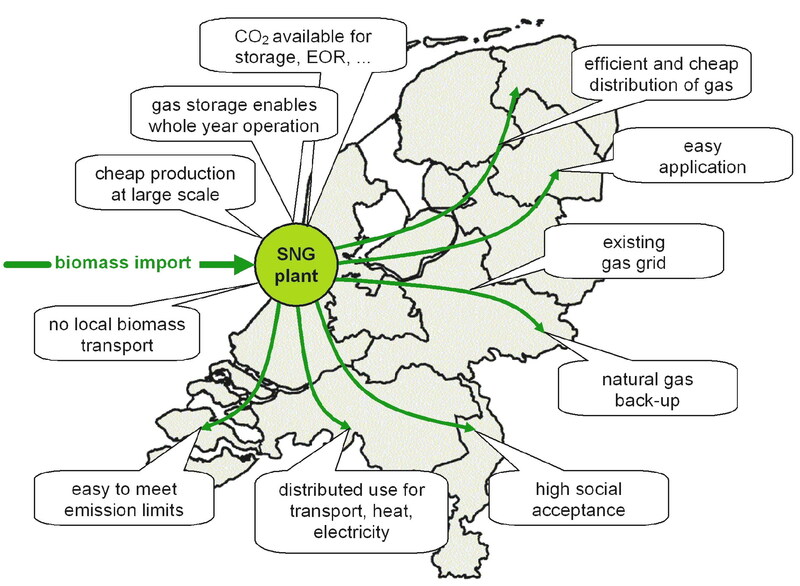 gaseous energy carriers produced from biomass comprising both biogas and Synthetic Natural Gas (SNG). Via this route can be benefited from all the advantages of natural gas, like the existing dense infrastructure, trade & supply network, and natural gas applications. The bioSNG website provides information on green natural gas in general and Synthetic Natural Gas from biomass (bio-SNG) in particular. It also clarifies the Ducth as well as international visions on renewable energy and provides the latest news on the progress in R&D from relevant actors and ongoing projects in the field of bio-SNG.